Students now have greater access to cutting-edge career development, advanced certifications, staff, and alumni and employer engagement options through Mohr Career Services at the Lundquist College of Business. A substantial gift from alumnus Jay Mohr ’76 and his wife Kim set the changes in motion. After time in Korea, South Africa, and the Washington, D.C. area, Rhee came to the Lundquist College of Business from California and has been in his position as executive director of Mohr Career Services for approximately six months. 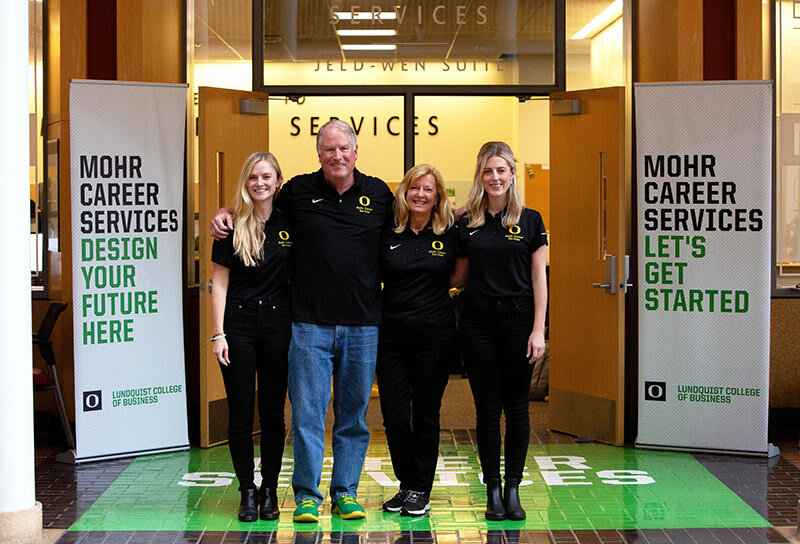 In addition, along with a bright new look, Mohr Career Services underwent structural changes this fall to provide even more robust offerings to students. The new career communities model Rhee and the Mohr Career Services team have established is divided into three distinct areas: career strategy, career exploration, and industry relations/employer and alumni engagement. This student-facing team delivers foundational career competencies and skills. This includes strategies for planning and maximizing students’ time at the Lundquist College of Business. Activities include career labs, participatory presentations, club engagement, one-on-one advising services, and more. Students can explore potential careers through numerous avenues at the college: our Job Shadow Program, mentoring programs, and internships. Mohr Career Services even offers financial support for internship expenses, as well as turn-key internship support for employers without an existing internship program structure. Additionally, the college is piloting a new line of short courses on in-demand industry subjects. Called Professional Edge, the program is managed through Mohr Career Services and provides short courses in such subjects as Excel, design thinking, Google Analytics, and QuickBooks. Professional Edge courses are currently open only to University of Oregon students, but could be expanded to welcome community members. This team facilitates a variety of customized engagements with alumni and employer partners through on-campus recruitment, networking events, company site visits, and student club activity. Hiring trends and talent needs evolve quickly and the industry relations/employer and alumni engagement team manages ongoing outreach to ensure that students are well poised to be competitive candidates in the marketplace. This new, three-part model allows the college to offer even more targeted career support to each business student, Rhee said. In addition to several key hires in Eugene, the college has also invested in our Portland-based career services presence. As assistant director of employer and alumni engagement, Shannon Aniciete is initiating fresh connections with Portland-area employers while maintaining and strengthening existing alumni relationships in an effort to grow the number and variety of employers hiring Lundquist College students. She joins the industry relations/employer and alumni engagement team.